Hiring a car in Portugal? Driving your own car to Portugal? We explain how to pay for using the toll roads in Portugal. Portugal has had toll roads for many year but at the end of 2011 they introduced the first electronic toll road, the A22 parallel to the Algarve coastline. Our guide will help you understand the different types of toll roads in Portugal and how you can pay for the tolls whether in a hire car or driving your own vehicle. What are the different types of toll roads in Portugal? Cameras automatically identify your car. You are then charged for the roads you use. Look out for the signs (shown in the above picture) and the gantries with cameras overhead which will indicate you are entering an electronic toll road. Please be aware that the Electronic Toll Roads indicated by this sign are NOT the same as the Via Verde lanes. These are designated lanes on a toll road. 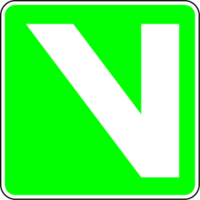 You will see the above sign either overhead, on a road sign or marked on the road surface. They also work electronically by automatically noting your vehicle's licence plate. These should only be used by those who have a Via Verde device (also known as a transponder) fitted. There are still some manual toll roads in Portugal where you will need to stop at a booth to pay. By far the easiest solution to paying for toll roads in Portugal when you are driving a hire car is to have a transponder fitted. 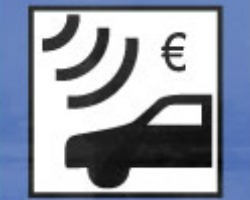 When you have one of these fitted in the car you can use any of the Electronic Toll Roads or Via Verde lanes and the tolls will then be paid by you to your car hire company when you return your rental car. Your hire company will more than likely offer these as an extra with your rental. Hire costs for the transponder vary but expect to pay about 12 Euros for the week. Through our sister company Clarify Car Hire you can easily compare car hires including the transponder using our filter. The toll rates will depend on how many you use and the length of your journey on them. You will hear your device bleep when you pass under a gantry on the electronic toll roads or Via Verde lanes which will signal that your vehicle has been registered. As charges take 48 hours to go through, any that you incur in the last couple of days of your hire will be charged straight to your credit card. The Via Verde devices are usually already installed in your hire car and they will be activated once you have paid for their rental. If you wonder where the device is, have a look behind your rear view mirror! In the unlikely event that your hire company do not offer them, they can be hired from CTT Post Offices, Via Verde stores and many service stations. . Your other option with a hire car is to pay at a CTT post office after you have used the Electronic toll roads (This system cannot be used with Via Verde lanes). The issue with this method is that you will have to ensure that you can get to an office within 5 days of using the road or face a fine. This is particularly a problem if you use a toll road in the last couple of days of your trip. Tolls are not registered until 2 days after you used the road and, if you have left the country, any charges plus fines are then passed to the hire company. There's also a good chance you can expect admin fees from your rental company on top for dealing with your toll charges! When you hire a car in Portugal it is important that you ask your car rental company how tolls are to be paid. This is the only option which will allow you to use the Via Verde lanes as well as the Electronic toll roads. These can be rented from many service stations, post offices or from Via Verde shops. Rentals cost around €6 for the first week and less for subsequent weeks. You will also have to leave a deposit for the device in the region of €30. Tollcards can be purchased online or at service stations and are then activated by using text messages so you will need a mobile phone that works in Portugal. You will need to text your licence plate and credit card numbers. The downside to this system is that you could leave Portugal without using all of your credit. This system enables you to link your credit card to the licence plate so it can be automatically charged. You can sign up at Welcome points at many border crossings. The Easytoll can also be bought at dispensing machines at some service stations. You will be issued a ticket as proof of purchase and your registration is valid for 30 days. Make sure you call to cancel the membership when you leave. What happens if I use a toll road in Portugal by mistake? You may consider trying to just avoid the toll roads but this may be easier said then done. If you mistakenly use an Electronic toll road or a Via Verde lane - don't panic! Your number plate will have been registered. 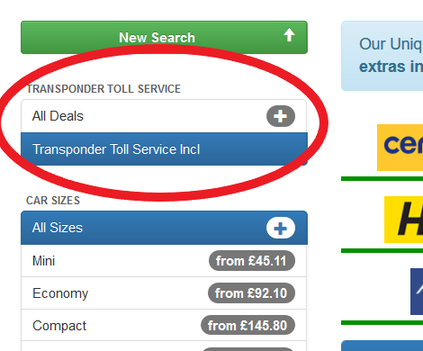 You can pay any tolls and fines online through Portugal Tolls and they also provide more information should you need it.